Meet Emma and her family. A Montessori Family - Brisbane. I would like to introduce you to Emma and her family. With three boys this looks like one busy household! I am a stay-at-home mother to three beautiful sons, aged 7.5, 4.5 and 17 months. My professional background is as a lawyer specialising in industrial relations and discrimination and since the birth of my oldest son, I have worked from home once my children are asleep at night (I am currently completing my PhD in discrimination law). We live in Brisbane, Queensland, Australia, in a high-set wooden house that we have renovated. It is quite a small home, but with a lovely big veranda and a yard big enough for our dog, chickens and children, as well as a large vegetable garden, worm farm, compost bins, fruit trees, sandpit and swings. When and how did you first become interested in the work of Montessori? My mother studied the Montessori approach when my older sister was a toddler, and so my three sisters and I were raised in a home that loosely adhered to some of the Montessori principles and had some Montessori equipment (the cylinder blocks that my youngest son is using were made by my father when I was young). After the birth of my first child, I became very interested in reading anything and everything about parenting, particularly literature with a Montessori or attachment-parenting focus. I started taking my son to a playgroup at a Montessori children’s house when he was 18 months old and gained inspiration from the teachers there that I have applied in our home environment. 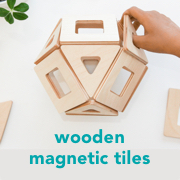 I love the beauty and simplicity of well-made Montessori materials and how they appeal to the child’s innate desire to master skills, as well as to their aesthetic and sense of order. I love how each piece of material is designed to teach one thing. I like that I am able to help my children by providing an appropriate environment and materials when they are expressing an interest and readiness in learning something new. Your blog Kylie! From what I can gather, we are very like-minded in both our approach to children and to Montessori in the home. Consequently, I find your blog a terrific source of inspiration and practical ideas. 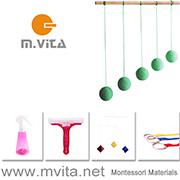 A list of Montessori books that I can recommend must of course start with Maria Montessori’s The Absorbent Mind and The Discovery of the Child. Other Montessori books I have particularly liked include: How to raise an amazing child: the Montessori way to bring up caring, confident children by Tim Seldin; Teach me to do it myself, by Maja Pitamic; Teaching Montessori in the Home: The Pre-school Years, by Elizabeth Hainstock; and John Bowman’s ebook, Montessori at Home: The Complete Guide to Doing Montessori Early Learning Activities at Home – it is full of terrific ideas and is very applicable to those using a Montessori approach in the home. Other non-Montessori books that have guided me on my parenting journey include Robin Grille’s Parenting for a Peaceful World and Heart to Heart Parenting; Hold on to Your Kids, by Gordon Neufeld and Gabor Mate; the series of books by Adele Faber and Elaine Mazlich (such as How to Talk so Kids Will Listen & Listen so Kids Will Talk and Siblings Without Rivalry); The Attachment Parenting Book by William and Martha Sears and Attachment Parenting by Katie Granju. I am inspired by my beautiful children and by their strong love of learning, interest in such a variety of things and creativity. In a world that can be very child-unfriendly and very driven by a focus on things that do not necessarily resonate with me, I love the simplicity and strength of the Montessori approach, with its focus on enabling children to develop into competent, caring and able people and to pursue their interests. I am also inspired by my husband who is very like-minded about parenting and extremely supportive of my mothering and of our children. My mother is also a source of inspiration – despite being widowed with four very young children she raised us in a very loving, interesting and creative environment where we were enabled to ‘do it ourselves’. Thank you for sharing your story with us Emma. Can you believe that Emma's father made those wonderful cylinder blocks and that Emma is raising her family while completing her PhD? Tomorrow I will publish some more photographs and show you around Emma's home in a little more detail.